Seven of Swords – Underhanded and Sneaky! In numerology, seven’s represent spirituality, reflection, assessment, discovery and knowledge. Some key words for the seven of swords are theft, being underhanded, trickery, deception and secrets. 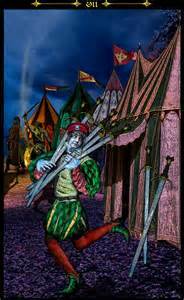 When the seven of swords appears in a reading it can indicate that someone is being sneaky and underhanded. You may be the person being deceptive and going behind someone’s back to manipulate a situation, or someone may be going behind your back. If you are the individual displaying this type of behavior you might want to rethink your position. When the seven of swords appears reversed, be careful! It indicates that any sneaky behavior and underhanded actions will eventually be revealed no matter how hard an individual tries to hide it. Their trickery and deception will come to the light!! This entry was posted in Suit of Swords and tagged The Seven of Swords. Bookmark the permalink.